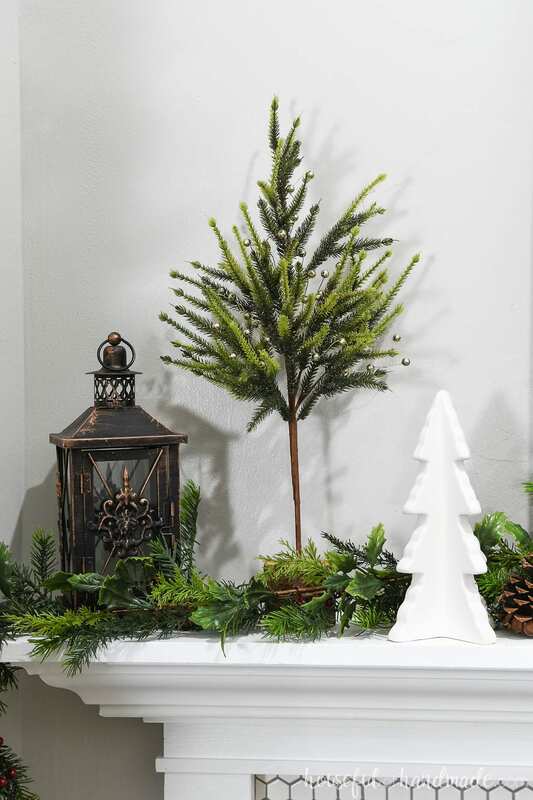 Decorate your home this holiday season with a classic Christmas mantel. It’s the most wonderful time of the year. Time to decorate the mantel for Christmas! 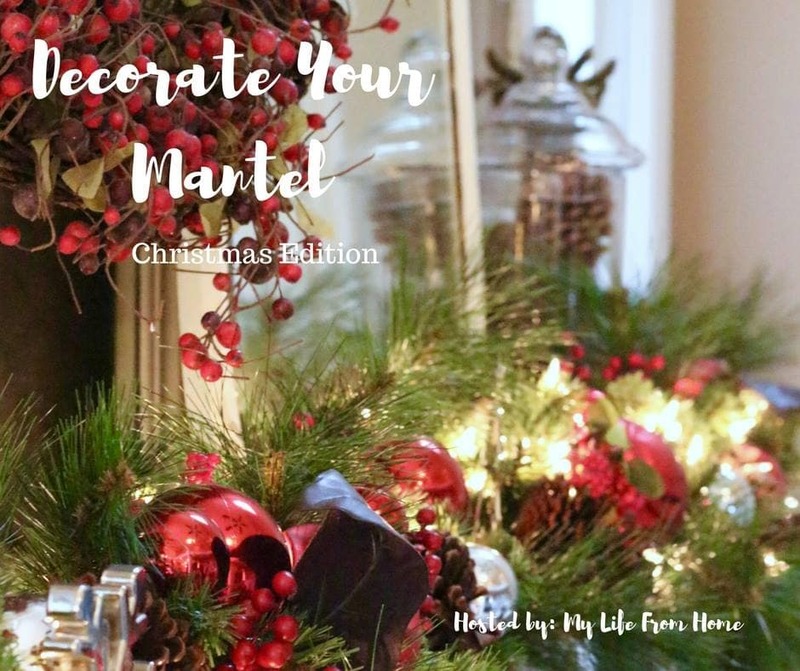 And I am joining up with some wonderful bloggers to share our beautiful Christmas mantels. 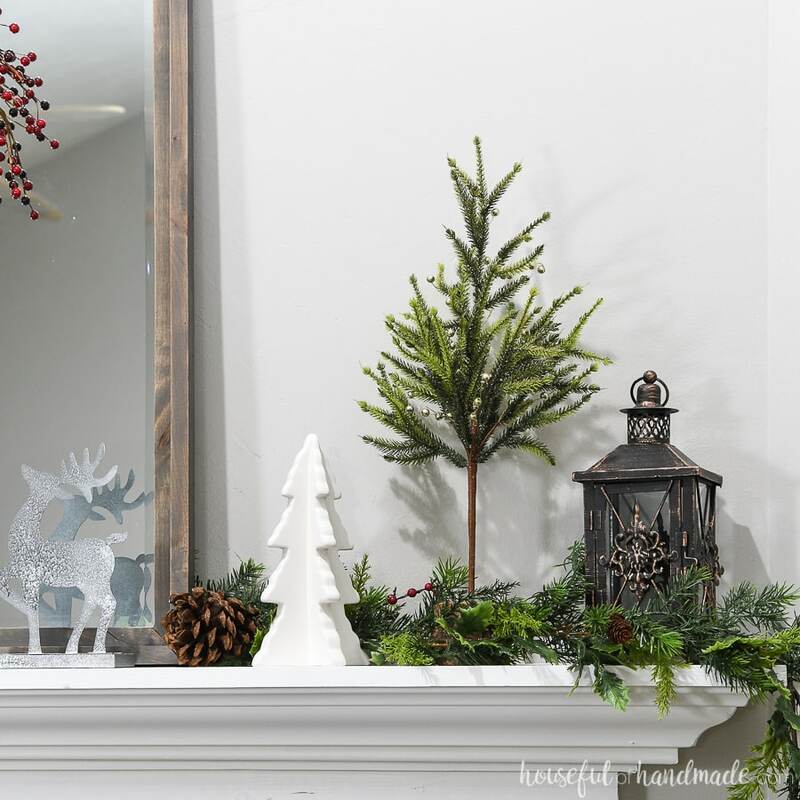 First I am so excited to share our classic Christmas mantel decor! This year we are doing an old-fashioned Christmas tree. I want strings of popcorn, cinnamon cookie and gingerbread house ornaments, and berries (but those will be fake). All the classics of a simple Christmas. So when it was time to decorate the mantel, I knew I wanted to keep it classic! That way it would match our tree (when we decorate it this weekend). It all started with the DIY Rustic Mirror. I keep this beautiful mirror on the mantel since I made it big enough to fill the large space. It also takes the first step of decorating the mantel away because I just place stuff around it. Bonus! 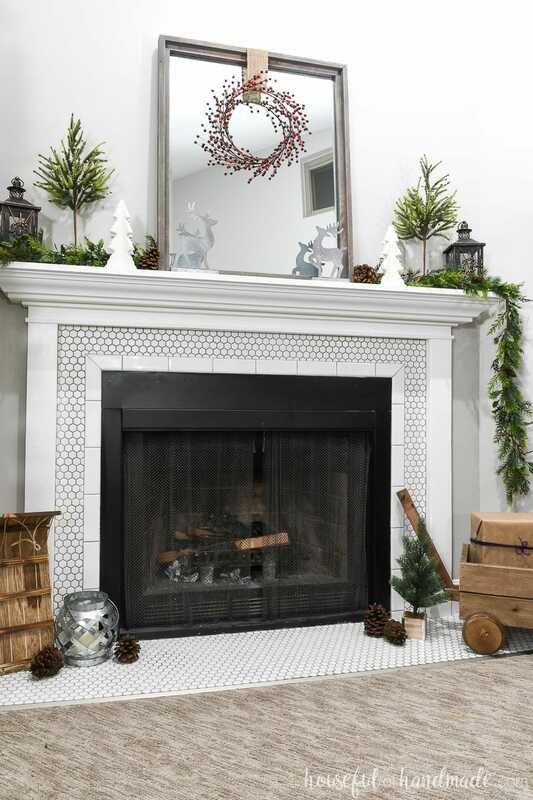 A classic Christmas mantel also has to have garland. Lots of garland! 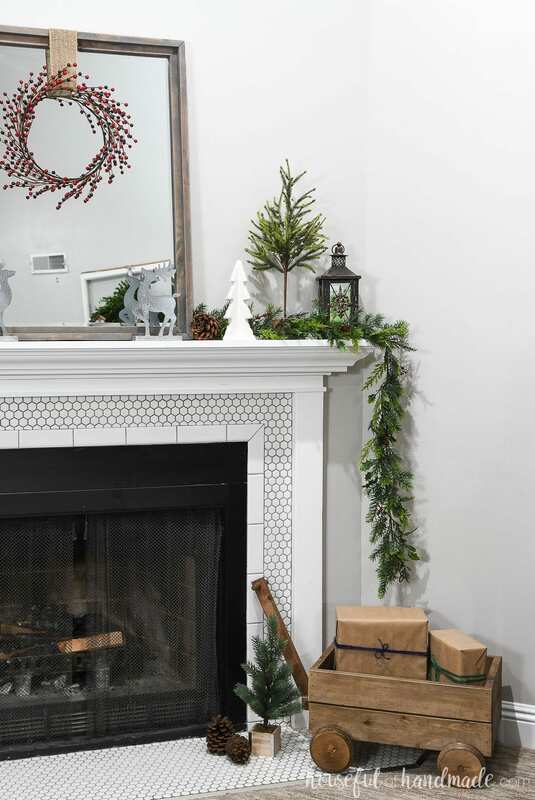 There are so many ways to add garland to a mantel. But again, I went for the classic drape. But to give it a little modern flair, I did tuck it behind the rustic mirror. So now the garland is not the main part of the mantel, but still gives it so much Christmasy goodness. 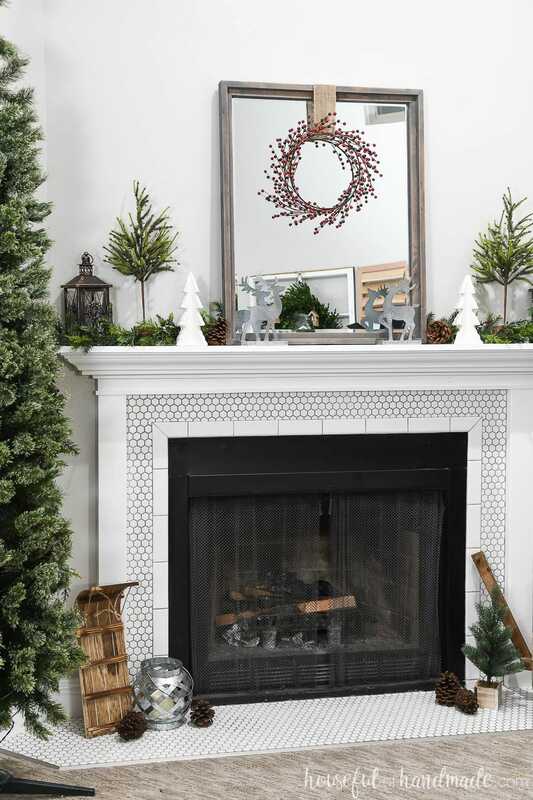 The other big element of the classic Christmas mantel is symmetry. I have been enjoying an asymmetrical mantel lately. But there is just something about a perfectly symmetrical design. And it makes my OCD heart so happy. To offset the symmetry of the mantel, I did decide to add some fun Christmas decor to the hearth of our fireplace. And this is more asymmetrical. I found this little toboggan in the Target Dollar Spot and just knew I had to have it. Then sadly, the day I brought it home, I crashed out Christmas down on it and broke it! Luckily it wasn’t anything that couldn’t be fixed with some wood glue and nails. So now our old-fashioned toboggan is ready to decorate the hearth. And on the other side, do you recognize the wood wagon? This is the wagon that I made for our fall. I decided to only paint Pumpkin Patch on one side because I knew it would also look awesome for our Christmas decor. Right now it is holding 2 empty boxes (I didn’t want it empty), but come Dec 1, I am going to put in 25 wrapped Christmas books for a fun advent calendar. 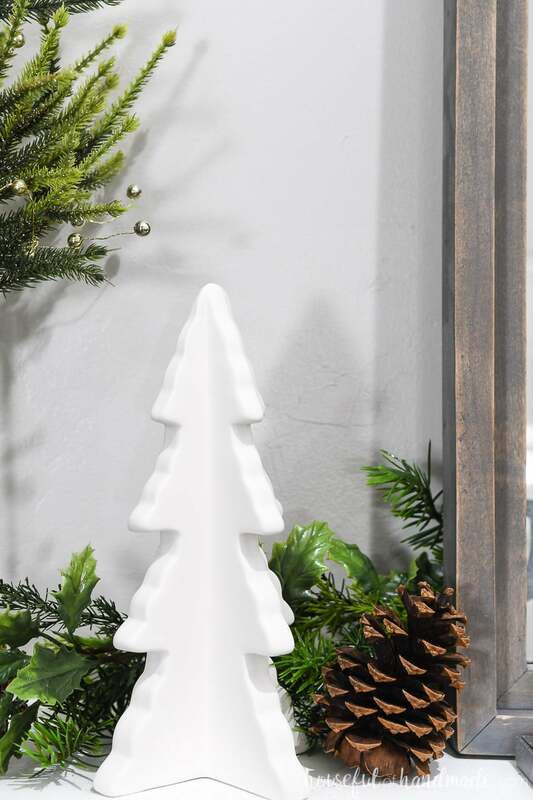 For the top of the mantel, I fell in love with these fun shaped Christmas trees at Kirkland today. They finally opened one up in our city and I made a quick trip in. Even though I am trying to stay away from glitter this year (I think we are still trying to get rid of all the glitter from years past), I couldn’t pass them up. The fun shape and tiny gold balls among the branches just called to me. So I placed them on the mantel with these simple white ceramic trees and some vintage looking lanterns. 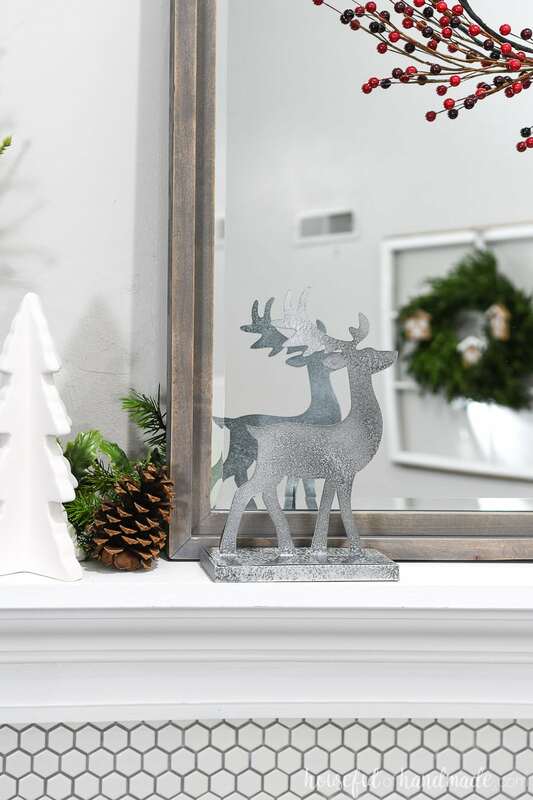 And finally the last detail on our classic Christmas mantel are the Christmas reindeer figurines. These are part of the 7 Days of Paper series going on right now (yep, this is the 1st of 2 posts going live today). I have always wanted cute little reindeer figures in my Christmas decor, but since I am too cheap to buy some, I made them! I hope you enjoyed our classic Christmas mantel tour as much as I loved sharing it. It makes me eager to get our old-fashioned Christmas tree decorated. 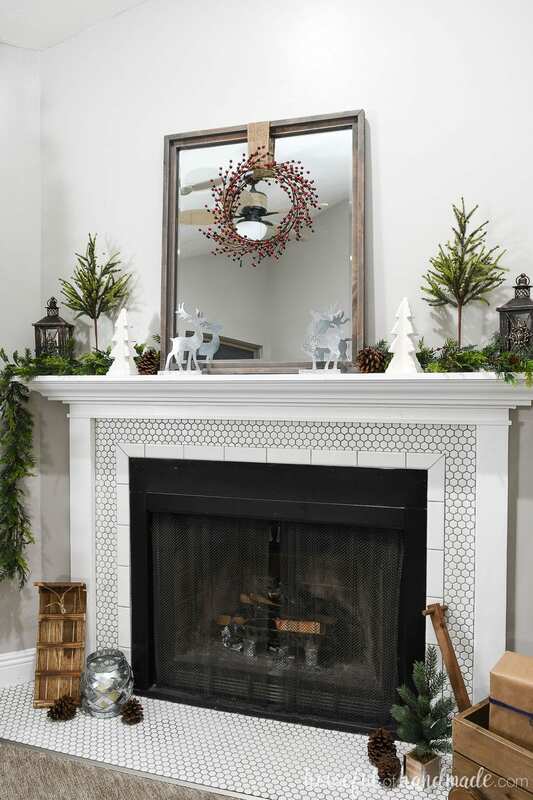 Now sit back and have fun checking out these other beautiful Christmas mantels. There is so much inspiration to get you started with your decorating! And don’t forget to check out the rest of Christmas decor! You did a fabulous job on your classic Christmas mantel! 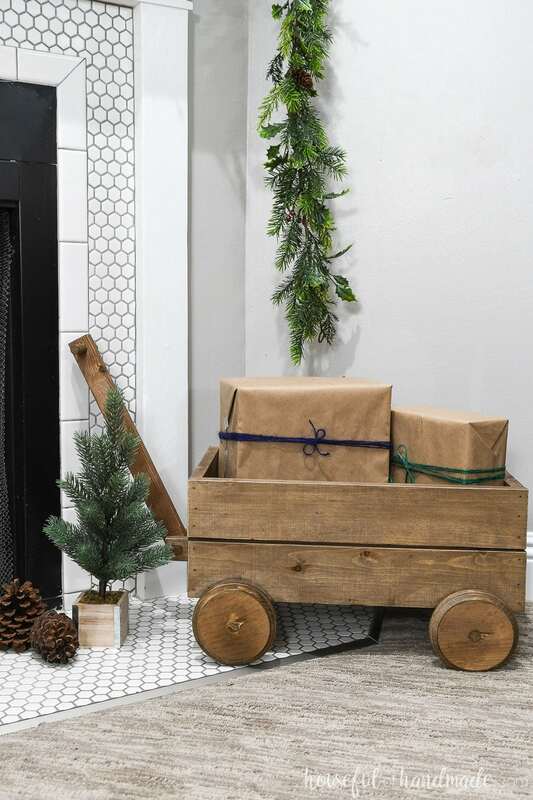 I love the look of draped garland on a Christmas mantel, and I think the toboggan and wagon suit your style perfectly! Thanks! I love the little toboggan and wagon so much. 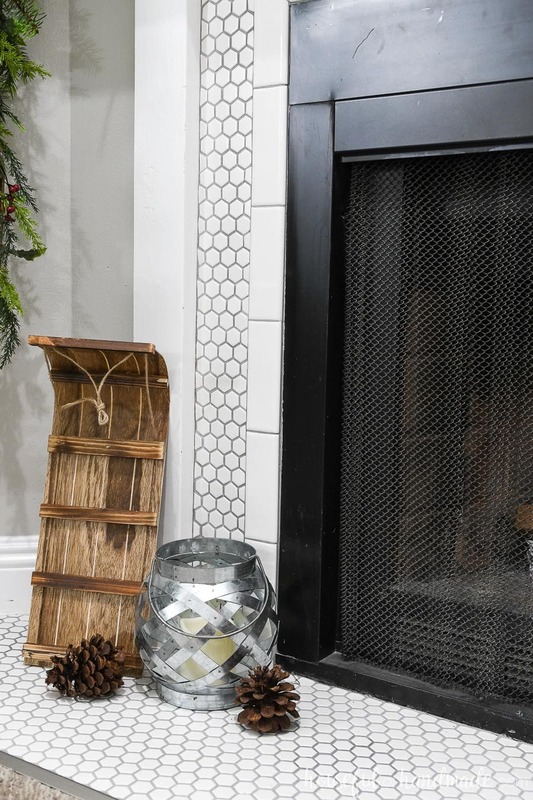 Kati – this classic Christmas mantel suits your home and personal style. We cannot believe that you handmade the deer! You are always a creative genius! You gals are so nice! Thanks. It’s beautiful! I love the traditional elements and all the fun touches. Classic Christmas at its best!